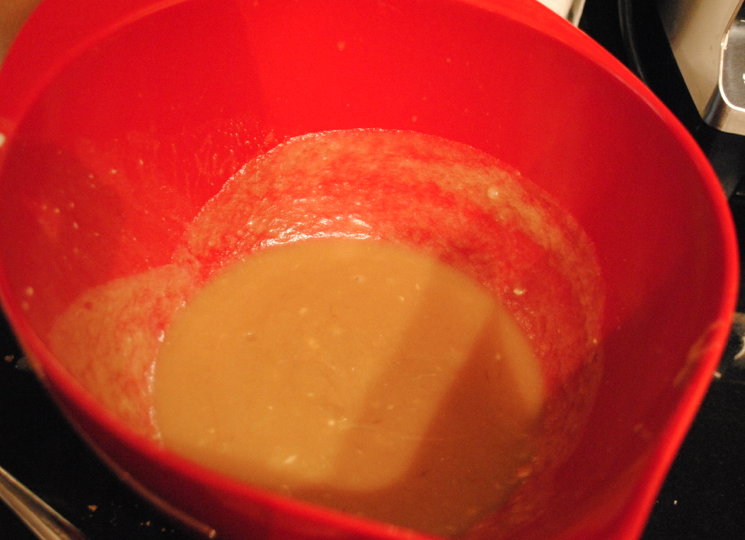 Butter and sugar together looks so delicious. But I will not eat it by the spoon, because it actually is PURE butter. My guns sure are getting bigger since I am making cookies without an electric blender. 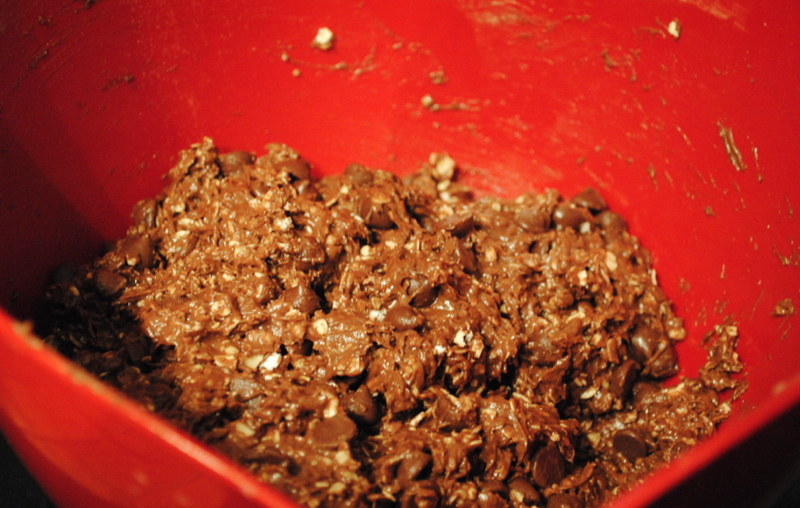 You can add any type of chocolate chips/chunks to this dough. 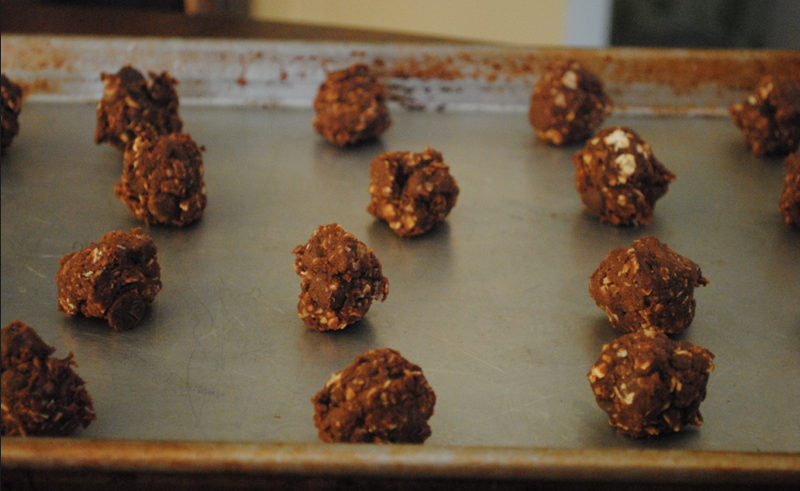 This time around, I used milk chocolate chips. Best. Cookie. Dough. Ever. EVA. EVA. EVA. I made them bite-size so that when a certain little boy, or a certain post-pregnant lady decided that they were hungry for cookies, they would nibble and snack on a couple of small cookies instead of 1 HUGE cookie. Because 2 small cookies have fewer calories than 1 normal size cookie, RIGHT? * Bake about 8-10 minutes until just done. Don’t overbake. Once again, do not overbake. I know that 8 minutes seems like a short time, but I cannot stress this enough. 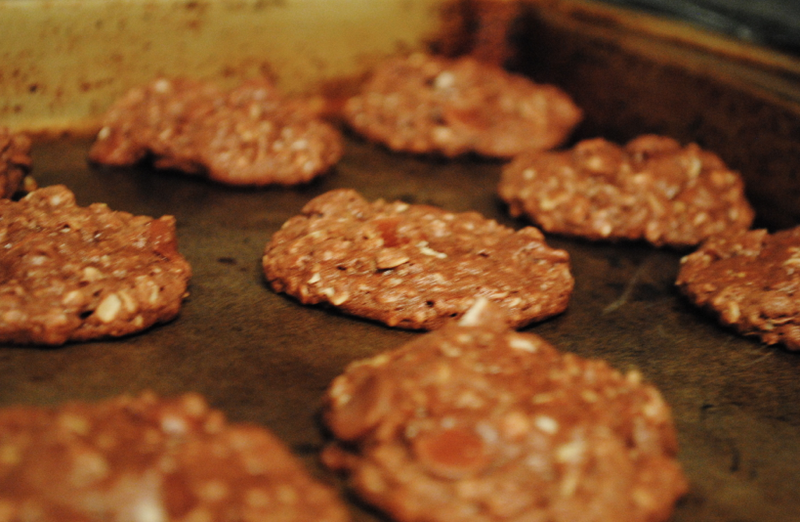 8 minutes is the perfect amount of time to make these cookies soft, chewy and scrumptious. They may not look quite done, but they will finish baking on the cookie sheet. * Cool for at least 5-10 minutes and transfer to wire rack. Cookies cooling on a wire rack. So good that you will eat half of them before they are off the rack. * They are definitely best eaten the same day as they do not keep well. The dough keeps in the fridge for a couple of days or freezer so you always have dessert on hand. Perfect for hoarders like me. Half of this batch was placed into tupperware and into the fridge for a later day. 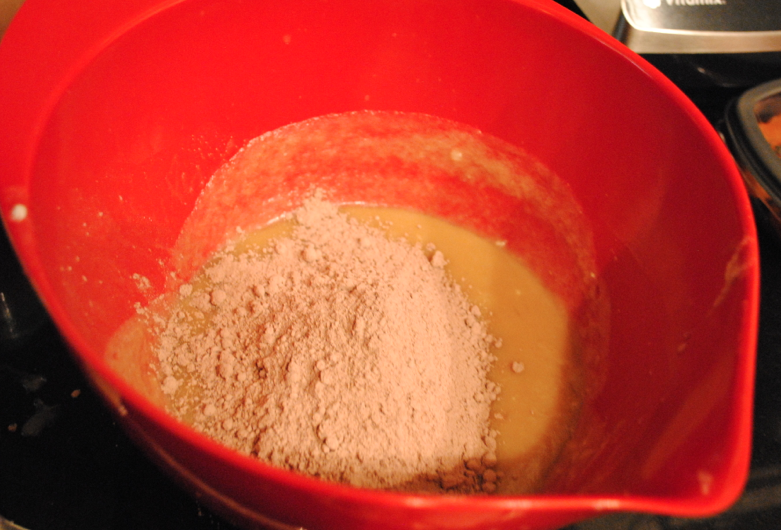 * You can use any flavor of cake mix, though obviously chocolate (milk, German, etc.) is best. * For those who want to make this somewhat healthy, you can also add grated carrot, coconut, a small amount of pineapple, wheat germ and/or ground flax. Doing so, would have been much more my style, but I thought GO BIG OR GO HOME. 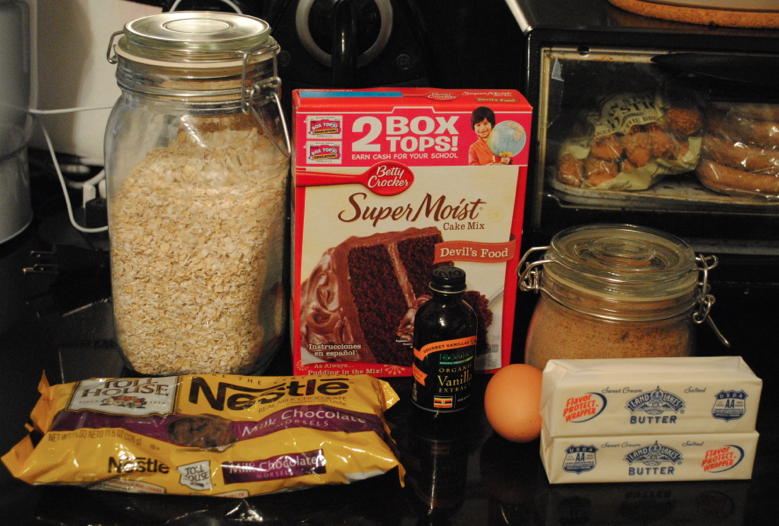 * You can replace part of the oatmeal with any crunchy cereal (Raisin Bran, Rice Krispies, granola, etc). 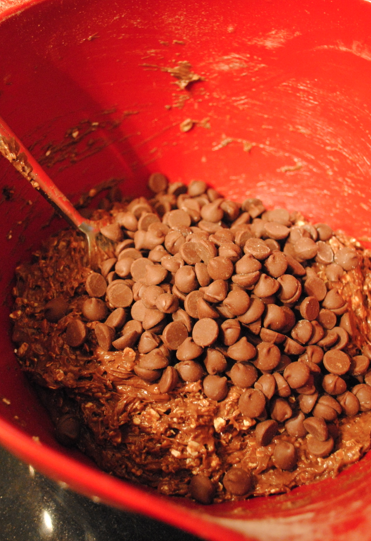 Nothing better sounding than Raisin Bran in chocolate cake mix cookies. 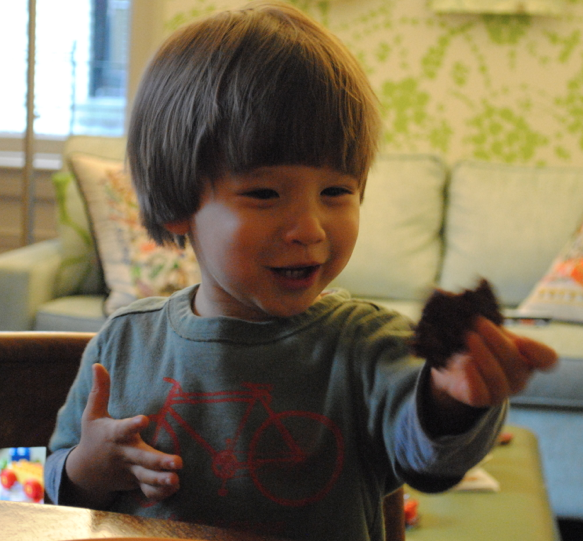 When Cruzzie tasted the cookie for the first time (because these are not the typical cookies in our household, obvi), he said "Mama best cookie." I swear. He is that cute. But please, no mocking his awesome bowl cut haircut. It was the worst day of my life and I couldn't tell the hair-cut lady that her skills sucked and he looked like he was from 1984. Have a great weekend! 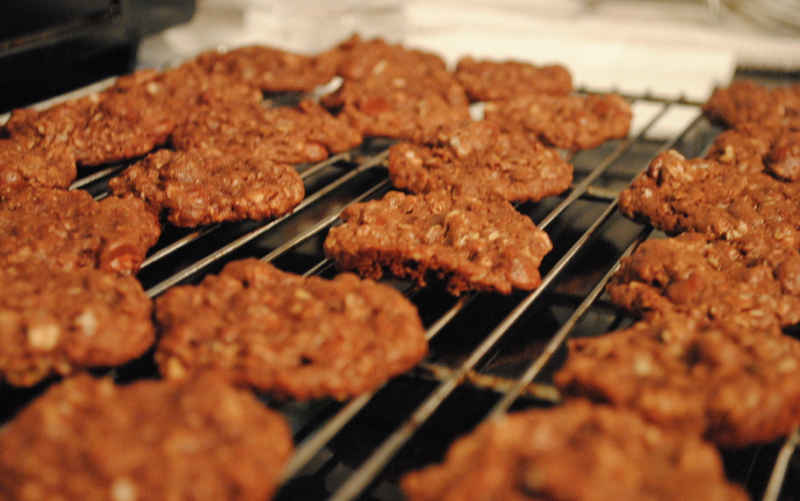 Make these cookies for your weekend BBQ, just DO IT. these look sinful. your son is adorable. Thanks! These are sinful — but amazing. A – These sound great! Just “Pinned” the receipe! Thanks! Yay, I love Cruzzie’s sweet expression! Your cookies are a hit, Jules!!! Anymore recipes to share with us all? Love this recipe. Julie is a cookie genius…didn’t this win the cookie category at the bakeoff? YEP — these one the cookie category. Can we have another bakeoff? ASAP! He is getting a real haircut tomorrow…. These sound great. Will make them this weekend. Is there any way of making this printable tho? I know the pictures def help with the making but aren’t really necessary and make it too much to print!! Let me look into this and get back to you! I can always send you the recipe as a word document? Let me know and I can email you. Thanks! By request, here is a link to a page with the recipe with no pictures/comments.